I've mentioned before on this blog that I'm not a Trekker or even a Trekkie. However, I was raised on Star Trek. My mom is a huge Trek fan and Star Trek has played a major role in my life. Needless to say, I've seen every episode of Star Trek ever, multiple times. And when J.J. Abrams' Star Trek came out, I took my mother for mother's day. Because that's the sort of family we are. I enjoyed the new Star Trek movie when I saw it. They avoided a direct canon violation with the time travel plot. Several of the actors embodied the essence of the people they were supposed to portray (looking at you, Karl Urban. 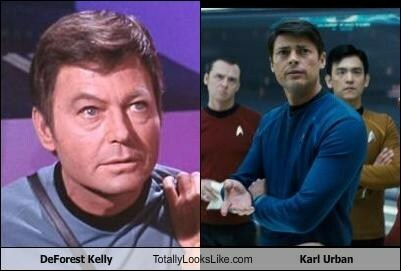 Part of me thinks this actor was possessed by the spirit of DeForest Kelley). And it mostly filled the Star Trek void that had been in my life since Enterprise went off the air. (Say what you will about the terrible middle seasons of Enterprise, season four was great and the show finally started doing what it should have been doing all along. Enterprise deserved the benefit of a season five). Also Chris Pine. Anyway, when I went to see Star Trek in theaters, I greatly enjoyed it. Much in the same way that despite it's flaws, I really enjoyed The Phantom Menace in theaters. The problem is when there is such a complete void in your life and they suddenly give you anything, you're willing to love it more than you should even in the face of major flaws. But like the Phantom Menace, as time went on, the more I thought about Star Trek, and the more it's flaws became apparent. And the more and more they bothered me. And since this week is when Star Trek Into Darkness comes out (trying my best not to rant about titles without colons that don't make sense), I thought it was time to talk about those flaws. As well as a few of the good things. Today let's highlight some of the things done well in the first Star Trek film. I said this earlier in the post and I'll say it again. Karl Urban channeled DeForest Kelley. Watching the movie I believed that Urban was a younger version of the crusty old McCoy we knew and loved. Also his lines about his wife and the divorce? PERFECT. That was a perfect little addition of back story that didn't detract from the McCoy we know and love from the original series and if anything added a little more history and depth. Also the fact that McCoy had been to med school, married and divorced before we even saw him on the screen gave him that extra bit of age McCoy needs to have on the rest of the characters. McCoy has been and always should be significantly older than Kirk and I was glad to see they kept that. I'm basically "meh" on Kirk's back story, since even though I don't like it, I can deal with it because we're in an altered timeline. 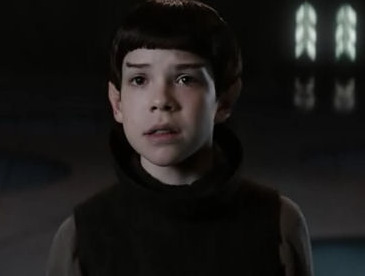 However, Spock's back story was note perfect. I greatly enjoy all the scenes of him growing up in Vulcan, depicting that even highly logical "more evolved" Vulcan kids are mean and have trouble accepting differences. I love the depth that this gives Spock, especially since it answers the question of "Why did Spock join Starfleet?" Though Vulcans and the Federation have a long history, the Vulcans had until this point always held themselves aloof of us mere humans.So it's great to see a rationale for Spock joining a group where he is very much a minority. This might seem a little weird, but I think my favorite thing about J.J. Abrams' Star Trek is that it got people into movie theaters and excited about Star Trek. It brought in people who may never have watched a Star Trek movie or show in their lives, or if they did they didn't enjoy it, and made them enjoy Star Trek. And I appreciate that. Because when people give money to things I love, it means I'm going to get more of the things I love! Which I'm all for! And hopefully this movie will help Star Trek regain popularity and get us what Star Trek really needs: a TV show. Because Star Trek is not the sort of franchise that's well served by being a movie. It needs a TV show to really explore the ideas that are the heart of Star Trek. But that's more related to Thursday's post so I won't rant about it here. Hollywood really hasn't tested me on this, but I'm pretty sure I'd see any movie Chris Pine was in. I fell in love with him in Princess Diaries 2, and even suffered through Just My Luck for him. So casting him as Captain Kirk was a good move. Even if I didn't agree with all the things they did with Kirk. Unfortunately, my little sister has called dibs on Chris Pine. So I'll have to stick with Tom Hiddleston and Christian Bale. But who needs Kirk when they have Batman, amirite? So that's what I liked about the new Star Trek. How about you? What were your favorite pieces of it?